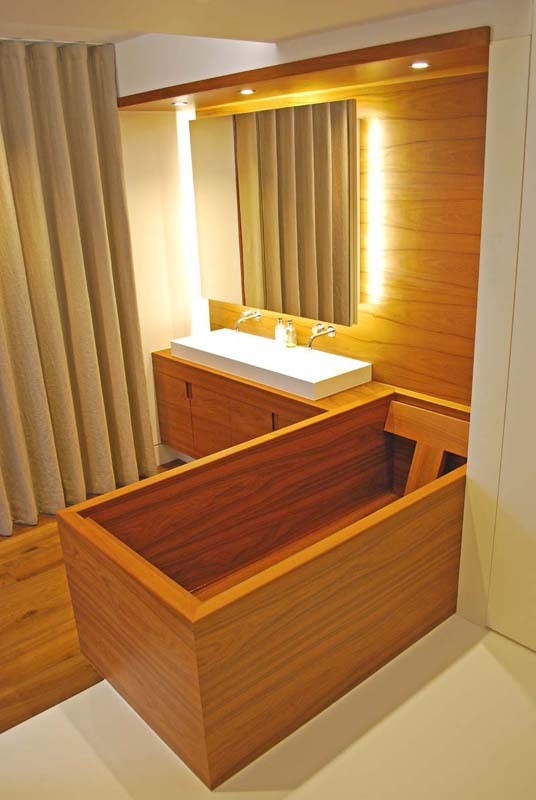 Why have a wooden bath? I made the first teak bath over 30 years ago and they have stood the test of time being both functional and a stunning piece of bathroom furniture. In our workshop we have standard sized baths, but many clients ask us to make them to a size to fit their project. If you would like a one to be made to a different size or specification as we are happy to make them bespoke, please just ask. Being made of timber means that the water keeps warmer for longer, so less time spent re-filling it, and more time spent just relaxing. The PU lacquer we finish our products with has incredible adhesion and can be used in a variety of situations; there will be no lifting of the lacquer in any wet room environment. The finish we generally supply our baths in is a low sheen finish which is lovely to the touch, and smooth on the skin. We have used the same PU lacquer for many years on our teak tiles which are used in steam rooms and saunas proving the lacquers stability in hot, wet environments. All our products can be provided un-lacquered which gives a different finish and doesn’t affect their water tightness. But, if you choose to have an un-lacquered teak or cedar bath you need to be aware that they will mark and get dented more easily. The back rest on our standard baths is adjustable, supporting your spine and shoulders giving you a sense of well being as you soak in a work of art. The deep baths come with a stool to step on to get into the bath, and then a step/seat to get into on the other side. The seat is removable so that you can get right inside and soak for as long as you like. With regards to the cleaning and upkeep of the baths it’s simple: we suggest a household cleaner similar to ‘Mr Muscle’ the same that you would use on an enamel bath – no extra special care is needed but we do not recommend using bleach. Perhaps once a year give them a good polish with something like an OSMO oil that can be found in most hardware outlets, this will rejuvenate them in the future. If you live in an area of hard water we do recommend the use of a water softener to avoid build-up of lime scale.